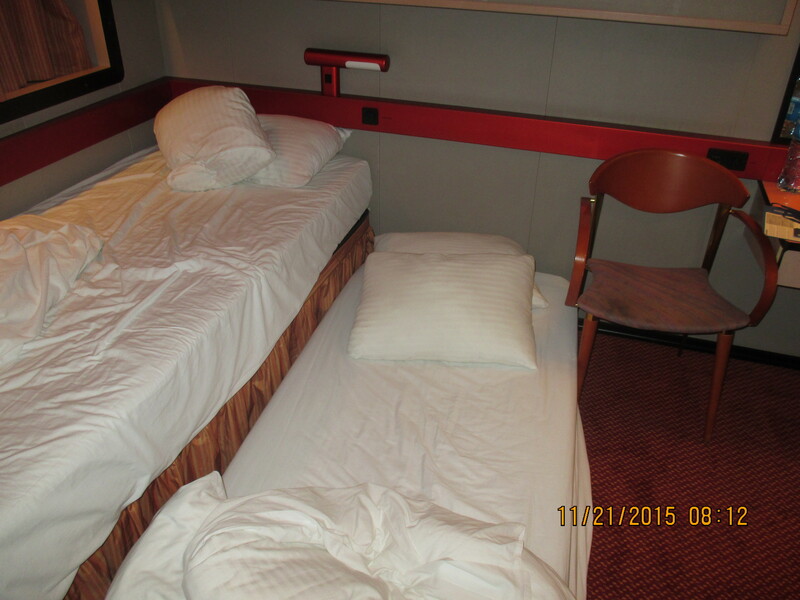 Being that this was our first cruise, we mistakenly reserved the bunk bed cabin while speaking to a rep on the phone. I asked about the twin beds and the rep on the phone said the beds could be pushed together for convenience. So we went ahead and booked it. However, what we were told turned out to be farce, it was a wall bunk bed. On board, we told customer relations that we are two 52-year old passengers with extreme back pain issues and neither one of us would be able to climb up on the small wooden ladder to get on the bunk bed. They said they could not do anything for us. We were not happy having to pay over $600 to end up sleeping on the floor!!! There was no customer relation efforts in improving our accommodations. 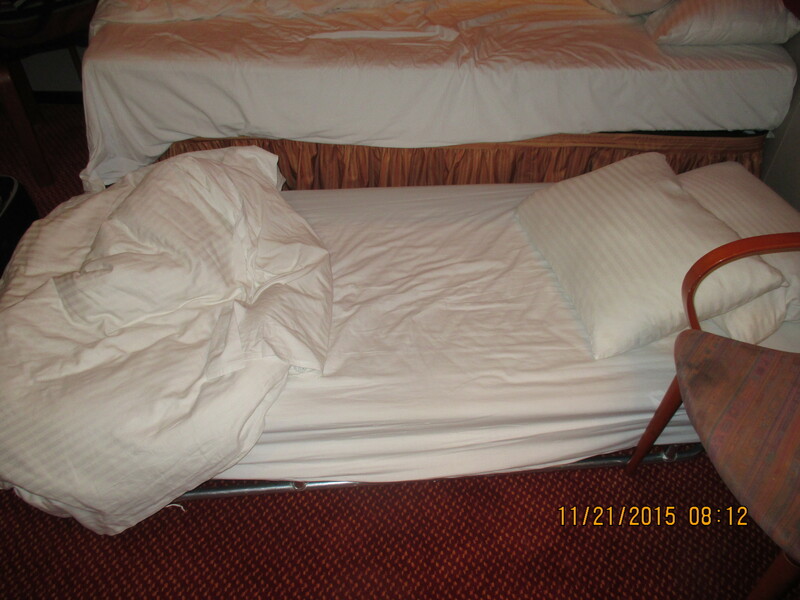 Would you sleep on the cabin floor after paying that amount of money for a cruise!!!??? We were given wrong information by a rep on the phone while making reservations online. 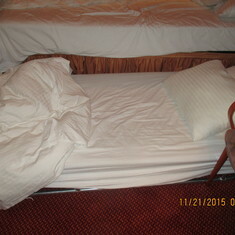 The rep said the beds can be pushed together, however, it was not true. There was a bunk bed on the wall. We are two 52-year old passengers with back issues and neither can climb up the little wooden ladder to jump on the bed. Customer relations did not go over and beyond to help our accommodations. We don't like the idea that we paid quite a bit of money to sleep on the floor for 4 days!!! If you call a Cruiseonly rep, please be sure that rep provides you with the right description of the cabin you are about to reserve. And before you buy the Funship coupon book offered on board, please read the expiration date make sure it does not expire one month after!!!! Sorry but the blame is on you. Do your research . Did you book through a Carnival rep at their 800 number or a travel agent? And I tend to agree with Coltsfan. No matter who you book through you can check out Carnivals website to research your cabin. It will tell you what kind of beds you have. The 2 bunks are the cheapest cabins. Unfortunately if a cruise is at capacity, there's nothing that can be done on board. the twin beds are shoved together to make one big bed, so the rep did tell you correctly, your mistake was referring to them as "twin" beds. Actually WildBill was elbom is referring to is an upper/lower which cannot be pushed together which would fall on the person he spoke to. But it's still up to each of us to check out what we have been given. I booked mine through Carnival and was given a connecting room which I didn't want. But checking it out I discovered that and was able to get it changed in advance. I understand that, but apparently when they asked the Carnival rep, they referred to them as "twin" beds which can indeed be pushed together, so as I said, the answer they got was correct as the question was asked. 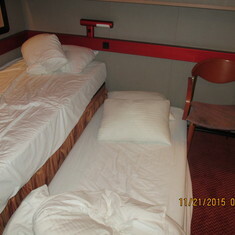 The lowest price rooms on Carnival are bunk bed cabins, I think a category 1A Upper/lower. In those cabins beds can not be pushed together. In the future, I would suggest that you have a deck plan open as you book so that you know what cabin your getting as you book it. 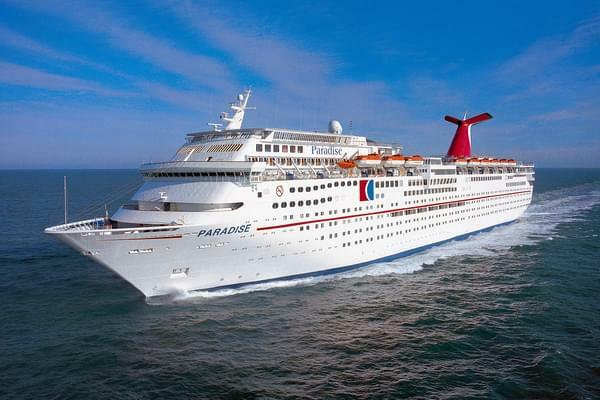 Carnival tends to book ships at 100% so there may not have been an open cabin to move you to. Once again JusMe nails it. When I find a cruise & ship that interests me, I always have the ships deckplans open when talking with my agent. Not only for the cabin design but for the location of the cabin and the venues around me (clubs, restaurants etc.). Cruise agencies buy blocks of cabins so they have various cabins in different categories to choose from. I have used CruisesOnly for 25 years to book my cruises and have never, EVER been given the wrong information! Between the time you booked the cruise and actually sailed (unless you booked last minute), you had more than enough time to dig deeper and change cabins if the assigned one didn't fit your needs.